Astonishing natural beauty collides with a slick urban scene in the sun-soaked capital of Western Australia. Just being near two of Perth’s natural icons – Kings Park and Cottesloe Beach – slows the breath and relaxes the mind. Visit both to understand the locals’ love for nature within the metropolis that is the capital of Western Australia. Northbridge’s William Street is Perth’s tastiest strip – try Shadow Wine Bar’s European fare, Bivouac Canteen & Bar for Middle Eastern fare, and Sauma for Indian ‘tapas’. Alex Hotel could well be the city’s most stylish boutique haunt. QT Perth is a sophisticated newcomer with personality and style. Como the Treasury offers world-class luxury and service. Before Perth existed, the grounds on which it stands were hunting and gathering lands for the area’s Indigenous people, the Noongar. Walter McGuire, an elder, is able to strip away the glass and steel of the built environment to reveal Perth’s past dating back tens of thousands of years. Choose from a selection of divine desserts at Wildflower Restaurant, Perth. As he leads a 1.5-hour walking tour around the new waterfront development, Elizabeth Quay, he points out sacred sites, traditional camping grounds and forgotten lake systems. Splash out on a degustation dinner that encapsulates the essence of Western Australia on every plate. Wildflower is a refined rooftop restaurant capturing native flavors through the use of distinct ingredients – many of them foraged by hand. 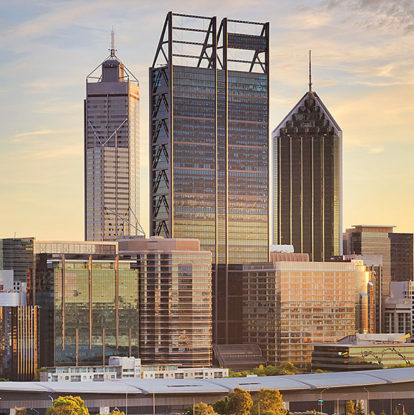 Only recently have rooftops become a ‘thing’ in Perth – surprising, given its blissful climate. For cocktails and glam, head to QT’s 18th-floor glass lookout; for dirty martinis and hipster-style mess hall tables, track down the laneway leading to Mechanics Institute Bar; alternately, take the car park elevator to Roof Top Movies on level six and be drawn into a kitsch world of AstroTurf, bean bags and palm trees. You could drive the three-hour southern journey, but why not jump aboard a seaplane that departs from the Swan River and flies you over raw wilderness before arriving at your destination just one hour later? Swan River Seaplanes offers three- and four-day retreats. Pullman Bunker Bay Resort‘s bush apartments immerse guests in the local experience; boardwalks lead to a beautiful deserted beach. Many of the fabulous wineries have equally fabulous restaurants; some highlights include Cullen and Wills Domain. Restaurant meals are included in the Swan River Seaplanes retreats; guides get you into the best spots around. A hop-on, hop-off bus whisks visitors easily between the Swan Valley’s many wine and foodie-oriented attractions. The Swan Valley Explorer costs less than $15 for a day pass and stops at more than 20 venues on a loop circuit. There are departures every 30 minutes from Guildford train station, an easy 20-minute journey from the city center. If you’re aching to feed kangaroos, get an up-close pic with a koala or watch a sheep dog muster, hop off at Caversham Wildlife Park. Continue on to see Aboriginal art at Maalinup Aboriginal Gallery, savor excellent chardonnay at Upper Reach Winery, taste beefy beers at Feral Brewing Company and nibble on dreamy macarons at Maison Saint Honore. The Colony at Mandoon Estate is a row of hotel-style apartments with sweeping bucolic views. The restaurant at Sandalford Wine serves polished modern-Australian dishes. White, sand-rimmed Rottnest Island winks from Perth’s horizon line, beckoning to locals who adore escaping to the car-free isle with its sleepy pace and simple pleasures. Look out for the island’s star, the cute quokka, a marsupial that pulls comical smiles. Take the 8:45am ferry along the Swan River for a scenic, 1.5-hour cruise en route to the island. Hire a bike or take the bus around to the bays and beaches – Geordie Bay is particularly popular for its shallow and still crystalline water. What could be better than setting up digs in a luxury safari tent – complete with en suite and a deck overlooking the beach? Discovery Rottnest Island will make the vision a reality when it opens in March this year; bookings are now open. The historic Hotel Rottnest – once the Western Australia governor’s summer residence – is the place to eat fresh seafood overlooking a yacht-dotted bay.